In the wake of the traumatic events of MESSIAH COMPLEX, Cyclops has disbanded the X-Men and Professor Xavierâ€™s dream is in ruins. People who where once considered friends are now discovered to be enemies. Families have been torn apart and teammates are now set adrift. X-MEN: DIVIDED WE STAND #1gives us five different stories of the after effect of the MESSIAH COMPLEX, by five different creative teams focusing on different mutants. X-MEN: DIVIDED WE STAND, BOOK #1 is the first of two books which is intended to look at the lives of a choice few individual mutants after their lives have been thrown into disarray with the disbandment of the X-Men. In this issue we have five different stories by five different creative teams. The efforts of these teams seem to be to set up certain characters for some future events, and the effects are mixed. To be completely transparent, I only have real history with two of the five stars in this book as I did not read the New X-Men book outside of the MESSIAH COMPLEX. Additionally, this review will not be a complete run down of the book, since I want to keep the word count reasonable. Trust me; this is my second crack at this particular review. First up, we have a story by Mike Carey and Brandon Peterson which focuses on Sam â€œCannonballâ€ Guthrie and his sister Paige â€œHuskâ€ Guthrie. A bubbly and energetic Paige arrives at the Blue Grass Airport to pick up her despondent brother, who is coming home after being hospitalized by Mr. Sinister. My first thought is, â€œWhy is a mutant whose power involves flight taking a plane home?â€, but I over look that. Sam looks like he is a war vet coming home after too many tours, and you get the sense that Paige realizes this and is trying to distract him with her continual flow of family news. Sam pretty much is ignoring her and his first actual words to her are to instruct her to stop into a local bar so he can get a drink. While in the bar, he passive-aggressively picks a fight with some old â€œacquaintancesâ€ that are none to happy to see him back in town. While Paige calms the bartender, Sam uses his four adversaries to forcibly rearrange the bar. SAM: How else you gonna work it through? Tell me that. The X-Men are gone. The schoolâ€™s gone. How else you gonna â€“ deal with it now? PAIGE: Sam, I know you had yourselves a war. But itâ€™s over. SAM: Itâ€™s never over, Paige. When did you ever know it to be over? Itâ€™s over when weâ€™re dead. Again, I really get the idea of a war veteran, and Petersonâ€™s art helps as he has given the old jovial Sam Guthrie the haunted look of a man who has seen too much. Sam continues to try and explain the feeling of emptiness and abandonment that he feels, but it is clear that Paige just doesnâ€™t understand. Finally, telling his sister that he has to find some way to keep his edge, or he might as well be dead. The conversation pretty much older, he proceeds to blast away, taking to the skies, leaving his loving sister behind to wonder what he will do if the edge is what kills him. The last panel contains an ominous, THE END? I really enjoyed this story, and felt that it was the strongest in the book. Petersonâ€™s art, combined with Justin Ponsorâ€™s colors hit all the right marks. Additionally, as a Southerner with an accent, I can say I approved of Careyâ€™s dialogue. When you can hear it rattle off in your head without much effort, you know it hits home. The second story is by writers Craig Kyle and Chris Yost with art by Sana Takeda and focuses on the New, sorry, X-New-X-Man known as Gentle, aka Nezhno Abidemi. As I did not read NEW X-MEN regularly, I had to research the character a little. We start with Nezhno remembering what he called the chaos of his time at Xavierâ€™s Institute, and how the lack of order nearly destroyed him. As we pullback, we find that he is on a plane, with Ororo (Storm) and they are one their way back to Wakanda. Despite receiving a royal welcome from Tâ€™challa (Black Panther) you get the sense that there is some trepidation among the Wakandan people in regards to Nezhno. During a doctorâ€™s visit, he is told that he will have to be given more vibranium tattoos, because his powers are still killing him. But why does he seem so distant? Well, that is because his mother is Wakandan, and his father was Russian. It seems that while the Wakandan people are tolerant, even accepting of mutants, they are not of outsiders. This is brought home as a small child comes up to as he sits in an outdoor cafÃ© and talks to him. As he begins to speak to the boy, the childâ€™s mother begins to frantically call for him to get away from Nezhno. In a rush to obey his mother, he runs blindly across the road, right into the path of an oncoming semi-truck. Using his powers, Nezhno saves the boy and demolishes the truck at the same time, only to have his heart crushed seconds later. It seems that the mother of the small child he just saved was his mother and the small boy, his brother. Despite Nezhno recognizing her and his having just saved her young son, she denounces him, telling him that the boy is nothing to him, and neither is she. As he sits on a porch contemplating his heritage, he realizes that the people he wanted to accept him, the Wakandas, donâ€™t. The New X-Men, whom he shunned, accepted him without question. He realized that he misses his teammates, and there is nothing he can do because the X-Men are no more. This was a good story, but I think that it was executed rather quickly and the feel is a little off. While you may feel for Nezhno, at the same time you get angry with him because he seems to have accepted his fate. The Anole story is written and drawn by Scottie Young with color assistance by Jean-Francois Beaulieu. We start off with Northstar receiving a phone call from Cyclops. It seems as if no one has heard from Anole in the three months since he returned home after the MESSIAH COMPLEX. Northstar finds the sixteen year old Anole hanging out around a tree house, presumably in his parentâ€™s backyard. Again, we go into a situation in which I have no history with the main character of the story, but it seems as if Northstar has a history with Anole, a pretty violent one. Anole reacts about like you would expect a teenager to react, with sarcasm and distrust. He tells Northstar to tell his old friends to leave him alone and not to come back. Misreading the reasons why Anole is confrontational, Northstar goes into the whole â€œbeing a mutant is hard, being a gay mutant is harderâ€ routine and Anole quickly shuts him down. The problem isnâ€™t being a mutant, or gay (he picked up on the reason Cyclops sent Northstar pretty quickly.) The people of the city and his parents accept him, and they welcomed him back with open arms. No anti-mutant/anti-gay hysteria here. He quickly makes Northstar feel 2 inches tall. Anole came home thinking that he would be the big man on campus, having been and X-Man, only to discover how far behind he was in his academic studies. Things worsen when his combat training kicks in and causes him to attack his father over an accidentally broken coffee cup. He then blasts Northstar, and In absentia the X-Men, for putting him and his classmates in that situation that essentially stole their childhood. They worshipped the X-Men, and sent them all home when they didnâ€™t need them anymore. He tells Northstar that no one should come looking for him, heâ€™s done with them. He leaves a note pinned to his stuffed lizard apologizing to his parents, and runs away. Now Iâ€™m sure I am going to catch some flak for this, but to me, this story is one that you could dropped any young X-Man in. For our fourth foray into a world without X-Men, we find Julian Keller, aka Hellion, in a story by Chris Yost with art by David LaFuente. Same warning as before: I did not read New X-Men. Hellion gives a quick recap of what happened during the last few months while he is having coffee with an unidentified person. He tells of waking up in an apartment being treated for his wounds after his battle with Lady Deathstrike and the Reavers, to find Emma Frost watching over him. She tells him of the break-up of the X-Men and the scattering of the students, to which he reacts badly, blaming her for taking everything away from him again. Frost knocks him out and when he wakes up he finds that his hotel room, food and everything had been paid for by Warren Worthington. He goes to his parentsâ€™ home to discover that they have sold it and moved. â€œTheyâ€™d rather give everything up rather than take me back in.â€ After he throws an Alpha-Level mutant fit, complete with pretty green fireworks, and Emma Frost still does not show up, he begins his search for his next option. That option turns out to be Magneto, who is the mystery person he is having coffee with. He offers his power to Magneto in his battle against the mankind and the X-Men, and Magneto turns him down. Hellion throws another fit (sad that all that training with the X-Men did not seem to take) and Magneto tells him how he reminds him of his son: arrogant, but desperate to please. After he has lost his family, his friends died, his heart broken, his beliefs shattered and finally the X-Men abandoning him, he decides to turn to their greatest enemy. Like a jilted lover, he wishes to hurt the X-Men because he loves them so much. Finally, he tells Hellion that he needs to look upon everything that has happened as a gift, that he now has time. Enjoy it before the war comes. Again, like the Anole story, we have a story that comes from a good place with good intentions, but is actually generic. Place almost any young X-Man in that position and the story rings the same. Finally, in our fifth story, Matt Fraction writes while Jamie McKelvie illustrates a story with Scalphunter and Nightcrawler. Here is how it breaks down, Scalphunter is on the run from the X-Men after the big event, and is hiding out as a short-order cook in an old fashioned roadside diner in the desert. There is a priest who continually talks to him about a German-Jewish philosopher during World War II named Walter Benjamin. Some of Benjaminâ€™s ideas involved the question of whether or not art had auras, and if looking at a copy or photo of art was the same as experiencing the art itself. Yeah, remember that little bit, because that is the big hook for this story. The priest has been in everyday, ordering the same thing, and proclaiming there was a little bit of God in Scalphunterâ€™s cooking, essentially insinuating that he was an artist. All of Scalphunterâ€™s dialogue revolves thought ballons, sorry, caption boxes, wishing that he could kill the priest to shut him up, how worried he is about the X-Men finding him, and how he is the clone of the clone of the clone of a very bad man. News to me, I never realized that Scalphunter was a clone. The second day, the priest comes back and continues to discuss Walter Benjaminâ€™s ideas, but also begins to discuss how he tries to look for God in everything. After again telling him, â€œNo Habla Inglesâ€ Scalphunter decides that he is leaving that night, as he is getting to paranoid. That night, as he is packing, Nightcrawler bamfs into the room and kicks Scalphunter through a window. Scrambling for his gun, he fires on Nightcrawler and gives the artist a chance to show Kurt bamfing around and performing acrobatics. Now, it is obvious that the priest was Nightcrawler, but this Nightcrawler does not seem to have the same soul as the fuzzy elf that is so dear to me. Essentially the references to Walter Benjamin and his ideas regarding mass reproduction, as well as the comments regarding wanting to look for God in a everything, where just a set up for this part of the story. To cut to the chase, Nightcrawler tells Scalphunter that he had originally come to kill him, but decided against it. While he asks at first if he is right with God, Nightcrawler then tells him that he believes that Scalphunter is a copy of a copy of a copy, a thing, Godless. Like a picture of a work of art. He says it would be a waste to punish such a copy, because the punishment would not mean anything. There is nothing where his soul should be; nothing where his art should be, nothing where God should be. He then tells Scalphunter that is leaving him alive so he should know that Kurt has forgiven him for all of his sins, and that with that knowledge he may experience some grace. We come full circle with Kurt telling Scalphunter that Walter Benjamin killed himself after the Naziâ€™s hunted him to Spain. The full story of Benjamin is slightly different, but for the purposes of this story, that is what you need. In the end, Kurt walks away into the night after having forgiven Scalphunter, who decides to stay at the diner, and begins to wear a small golden cross. I know that this story is probably a seed for some big future event (I call Scalphunter sacrificing himself for some great good and proving his humaity) but I have mixed feelings about it. Not because of the discussion of God or Walter Benjamin, but because I just do not believe that Fractionâ€™s Nightcrawler acted in a way that the established Nightcrawler would have. Maybe if McKelvie had not drawn Nightcrawler with an evil looking fanged smile in so many panels, and made him a little more reverent, the story would have worked better for me. This book is obviously meant to get tell a few stories that they could not tell in the regular books. That being said, I decided to grade to stories separately, and give an average score to the whole book. The Cannonball/Husk story was the best of the lot to me, but still had a few flaws. I give it 4 out of 5. The Gentle story was good, but I blame more my ignorance of the character than the story for any dislike I may have felt. I give it 3 out of 5. The Anole and Hellion stories both suffer from the same problem, a generic plot that could be used for multiple characters, for one I give a 2, and the other a 2.5. Finally, I give the Nightcrawler story a 3, the art was good, but I wonder if it did not make soe of the intent of the story unclear. 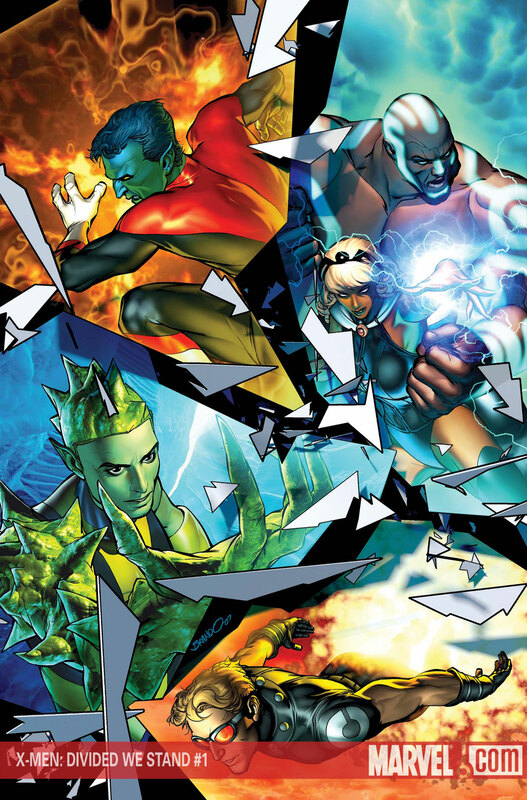 So, once we add it all up, I give X-MEN â€“ DIVIDED WE STAND, BOOK 1 a total score of 2.9, rounded up to 3 out of 5 stars. These stories would have been better told as back-ups in the monthly X-Men titles. Here’s the thing about this issue to me: I don’t expect to see any follow up with any of these developments. X-Men come and go, and then a few years later, somebody gets homesick for their old favorites and brings back, say, Cannonball or Shatterstar. Then, inevitably, Marvel goes back to the “Core Team” from Claremont’s Uncanny run, adding one or two new elements (like Stacy X or Marrow) before the next big event resets it all. As I said in the article, I really only cared a lot for 1 story, and that was the Cannonball one. Of course, I was a New Mutant fan from the Graphic Novel days. In retrospect, I actually was probably a little forgiving in this review, and it really needs to be only a 2 or 2.5. The original (in one of it’s incarnations) core team will return, but we will have to put up with a couple of years worth of wannabes until then. I actually believe most of these stories may have reprocussions. We’ve already seen the result of the Cannonball Husk story in the reveal at the end of Young X-Men #1. I think the New X-Men stories are setting up for them to reunite somewhere down the line. Gentle finally realizing he was part of the team, Anole realizing he’ll never fit in as a normal kid again, Julian wanting to get back at the X-Men. If it wasn’t for Young X-Men #1 i could see these guys forming a new Brotherhood. And like it was said in the review Scalphunter sacraficing himself or something of that sort.